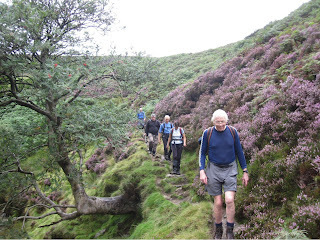 Kinder Scout Walk 2nd September. KenF. 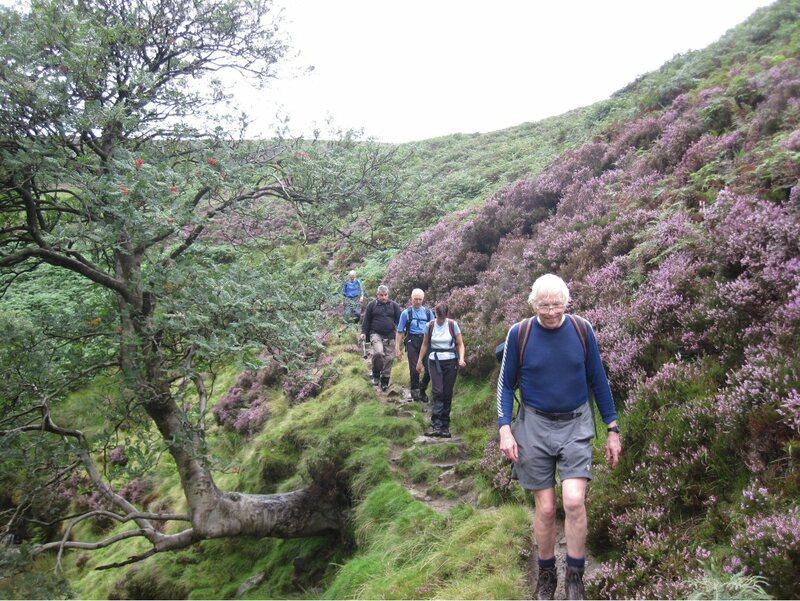 Under normal conditions this walk is a challenge being 12 miles long and having a double ascent amounting to 2000 ft. This wet summer made it something else. We left Hayfield at 9.30am and headed for a misty Kinder Scout. There were occasional flurries of light rain. At the Downfall we postponed elevenses and headed straight across the peat hags on a compass bearing to Fair Brook Naze. It is usual to find gravel channels leading in the approximate direction of the Naze but much work is being done by the Water board to control erosion so many of these channels were blocked with water and silt. Some attempts had been made to grass the individual steep sided peat mounds transplanting grass seedlings – a remarkable effort. We hope our trek over didn’t disturb any of these conservation attempts. The descent down Fair Brook Naze was a pleasure as always. The rain had stopped and we were bathed in sunshine. A quick meal and a pint at the Snake Inn and we were off for the next ascent over Ashops Clough returning to Hayfield at 5.30. A hard day but what a good mountaineering workout. .